SHINE [on], Ontario, SHINE [on]. That is the slogan for the upcoming month-long Ontario LCBO wine promotion that includes this year’s largest contingent of Ontario wines released on Saturday at Vintages. The program runs from Sept. 15 to Oct. 12 and will showcase Ontario’s 100% VQA wine, food and culinary talent. Its main focus is providing LCBO customers with an opportunity to discover Ontario VQA wines and is backed up by a gigantic print, digital and radio advertising campaign along with a social media component. It’s the Golden Age for wine consumers who do their shopping at the government-owned monopoly (which is pretty much everyone … what choice do we have?). The government is burning up a lot of our hard-earned money (taxes, markups on booze, etc.) into huge promotions to get us to buy more Ontario wine. It’s no coincidence, of course, that the LCBO honchos and head wino Premier Kathleen Wynne are feeling the pressure from a population that’s sick and tired of antiquated liquor laws in Ontario, a one-size-fits-all monopoly that does our shopping for us and puts all the wines it deems drinkable in neat little rows at hundreds of copycat LCBO stores across the province. No, it’s no coincidence at all (sarcasm alert) that as the drums beat louder for privatization, or at least partial privatization, the LCBO steps up to the plate with increased access to more and more Ontario wines. Trouble is, the vast majority of Ontario wines never ever make it to LCBO shelves and have only their winery retail store shelves to sell their wines. The system employed by the LCBO leaves little chance for over 90% of wines ever making it to the LCBO. 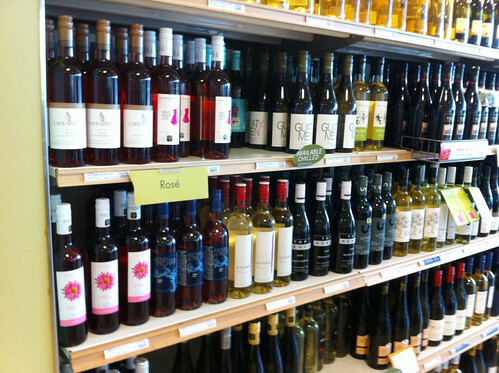 In a private system, let’s say the model endorsed by the Ontario Wine Council, which is a partial private model that allows a pre-determined number of licenced stores to open with the freedom to sell Ontario wines along with whatever else they see fit, the small wineries increase their chances of finding retail space as each store has its own buyer. It’s all about greater access to consumers; that is what they need and want to make their businesses viable. I have been told, off the record, that they are beginning to finally listen at Queen’s Park. They have heard the grumbling, read the editorials, seen the vitriol on social media and are finally realizing that there is a benefit to allowing the private sector do what it does best: Retail. And I’m sure they have read with great interest this recent story in the Calgary Herald about the success of Alberta’s long-ago move to privatization which amounts to greater choice for consumers, greater convenience and more profit with less infrastructure for the province to deal with. The Herald story tells those of us who have lived or visited Alberta what we already know. When visiting this past August I was reminded of how incredibly lucky they are in Alberta to be able to shop at myriad wine stores with a vast and complete selection of wines. 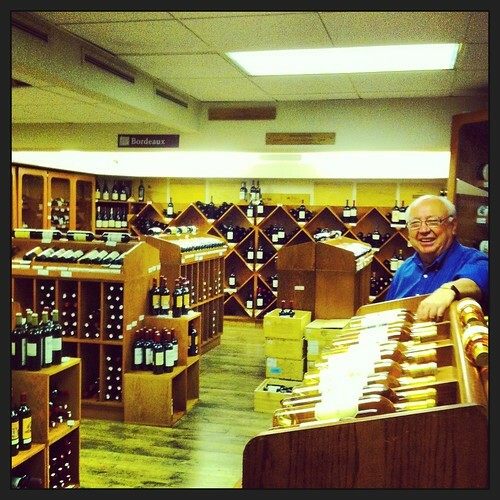 I was in awe of the Burgundy and Bordeaux collection (see photo) at Willow Park Wines and Spirits in Calgary. There was more to choose from in one room than all the LCBO stores have combined in St. Catharines. In Alberta, everyone is a winner. Change will be brought about because of pressure from us, the consumers, to convince the province that what they are doing is wrong, out-dated and insanely ridiculous in the year 2013. It will start with intelligent government finance guys doing the math on a better system for the government. It will trickle up to the politicians and the bold ones will take a stand and make the right decision. 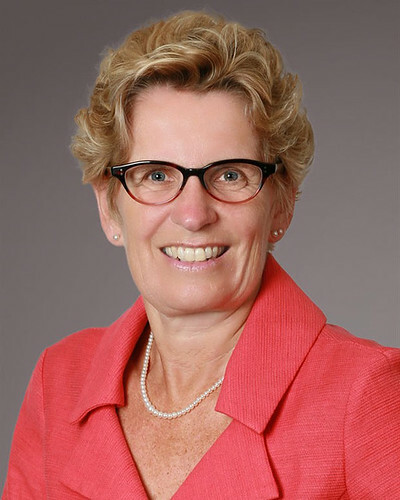 I’m not convinced it will be Kathleen Wynne (she’s never uttered a word about it publicly and has even rejected a small gesture such as cross-border wine purchases) or the Liberals who will do the right thing, but I could be wrong. Conservative leader Tim Hudak has already indicated he’s in favour of exploring all avenues and that the status quo is not acceptable. As for the NDP? It will never happen under their watch, the powerful LCBO union would rip them apart. So, with that out of the way, let’s get to Saturday’s huge release at Vintages stores. And, remember, if you can make it out to wine country and support the many wineries that don’t make it onto LCBO shelves, please do. Nothing like the smell of harvest and fermentation to get the juices going. Jackson-Triggs Entourage Grand Reserve Methode Classique Brut 2009, Niagara ($23, 91 points) — A very fine and affordable sparkler from Niagara with a creamy, yet fresh fruit nose of lemon-lime, brioche, green apple, toasted vanilla and a touch of tangerine. The mousse is vigorous on the palate with zesty lemon, poached pear and minerals all delivered on a racy beam of acidity. A tiny kiss of honey shines through on the finish. Try with caviar, sushi or smoked trout. Fielding Estate Bottled Pinot Gris 2012 ($22, 90 points) — The fruit is sourced from the winery’s Tufford Road property and from the newer (eight years and up) vines. 20% of the fruit is fermented in older oak barrels. There is a lovely spiced apple note on the nose, with more fruit concentration, pear, ginger and nutmeg. It’s juicy and textually pleasing in the mouth with pear, apple, peach fuzz and just a touch of citrus on the finish. Featherstone Black Sheep Riesling 2012 ($17, 89 points) — Always a favourite Riesling of mine, the Black Sheep shows bright apple, lemon-lime, peach and mineral notes on the nose. It’s made in an off-dry style (22 g/l) but the bright core of acidity still gives a nice sweet-tart ying and yang on the palate. It’s light and refreshing in the mouth with persistent fruits and a subtle vein of minerality that should build in intensity as it ages. Daniel Lenko Gewurztraminer 2009 ($25, 88 points) — Lenko is a believer in this grape for Niagara. He has three acres under vine and tends to harvest the grapes earlier than some to maintain the acids and avoid the “over-stated spice rack” flavours that’s often associated with Gewurztraminers. The nose is complex with rose petals, citrus rind, grapefruit, honey and light clove spice. It shows balance on the palate with nice citrus and spiced apple flavours and decent acidity. Show age well. Bachelder Niagara Chardonnay 2011 ($30, 90 points) — Thomas Bachelder earned a coveted “Vintages Essential” listing for this Niagara Chardonnay. That means when the 2010 vintage runs out, the 2011 quickly fills the void. The 2011 vintage is simply delicious with a pear-apple nose and subtle notes of citrus and vanilla spice . I love the stony mineral profile on the palate and graceful finesse and length through the finish. It’s beautifully balanced by full-bore acidity. Superb Niagara “village” Chardonnay. 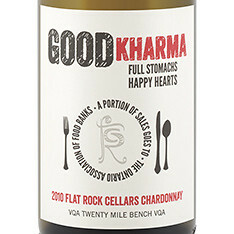 Flat Rock Cellars Good Kharma Chardonnay 2010 ($17, 88 points) — Flat Rock made this new wine (and label) with a portion of the sales going to the Ontario Association of Food Banks. It shows fresh apple, minerals, grapefruit, vanilla toast and spice. It’s rich and lush on the palate, a hallmark of the vintage, with pear-vanilla, butterscotch, spice and enough acidity to keep it fresh and lively. Reif Vidal Icewine 2011 ($25 for 200 ml, 93 points) — Textbook Vidal icewine with mango, peach, apricot, buckwheat honeycomb, cream and exotic spice aromas on the nose. The luxurious sweet fruits are broad and textured on the palate with a nice creamy and lush feel through the finish. Beautiful peach, apricot and tropical fruits with just a touch of candied orange rind lead to a super-long finish. Beautiful icewine. Le Clos Jordanne Village Reserve Pinot Noir 2010 ($30, 89 points) — The Village Reserve Pinot from 2010 is more about the generosity of fruit than the fine intricacies and nuances this grape can deliver. It has a big, obvious nose of bright cherry-raspberry fruit with a subtle savoury-spicy note. It is expressive and bold on the palate with flavours of warm raspberry jam, earth, savoury spice with a smooth texture, drying tannins and moderate acidity. Le Clos is usually built to improve in the cellar for a few years but this Village Reserve is drinking very nice right now. 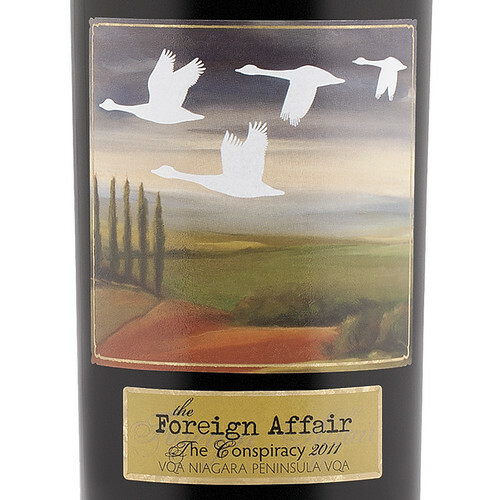 The Foreign Affair The Conspiracy 2011 ($20, 88 points) — Crispino elected to release the 2011 wines before the big, ripe 2010s, and, as noted, this contains declassified grapes from the top wines made at this winery. The wine is made in the ripasso style from 85% Cabernet Sauvignon and 15% Cabernet Franc. I love the nose of bold blueberry, cassis, currants, plums, nutmeg-vanilla and other sweet spices. It’s smooth and delicious on the palate with dark fruits, a touch of cherry, vanilla toast, licorice, herbs and chewy tannins. Great BBQ wine or cellar for a year or two. Vintage Ink Mark of Passion Merlot-Cabernet 2010 ($18, 88 points) — The fruit (Merlot, Cab Franc and Cab Sauv) was sourced from vineyards both on the Beamsville Bench in the lowlands of Niagara-on-the-Lake. The wine was aged for 16 months in oak. It has a powerful nose of cassis, blackcurrants, black cherry, roasted herbs and spice. It’s round on the palate and explodes with ripe black fruits and expressive spices. Very smooth delivery. Tawse Growers Blend Pinot Noir 2010 ($33, 90 points) — The popular Growers Blend in made from sourced Niagara fruit and is barrel fermented and barrel aged for 12 months (like all the Tawse Pinots). The nose shows gritty cherry and raspberry fruit, tart cranberry and some savoury-beefy notes. It’s earthy and meaty in the mouth with ripe tannins, savoury red fruits, anise and silky texture through the finish.